The family of renowned Northern Ireland actor and playwright Sam McCready have paid tribute to the Belfast-born man, who sadly passed away yesterday. Best-known for his acclaimed one man shows, including The Great Yeats! and Percy French: Melodies of Unforgotten Years, Mr McCready was a founder member of the Lyric Theatre in Belfast and influenced generations of actors through his teaching both at home and in the United States. In a touching message of Facebook today, Mr McCready’s son Richard said he would be “missed as much as he is celebrated”. He added: “It is with very heavy hearts that my mother, my sister-in-law Florence, and I need to let you all know that my dad, Sam McCready passed away last night. “The world has lost an amazing man, a poet, a playwright, an author, an actor, a director, a brother, a father, a husband, a mentor to all. Born in 1936, Mr McCready grew up during the war, and when his family home in East Belfast suffered during the Blitz, they moved out to the Hillsborough countryside, where the young boy discovered his love of reading. Throughout his childhood he developed his love of books and also began acting at a young age, delighting his school friends with his Shakespearean performances. At Grosvenor High School, Mr McCready developed a passion for musical theatre, and in particular for Gilbert and Sullivan, harbouring dreams of joining the world famous Gilbert and Sullivan company D’Oyly Carte. He later made a connection with the old Lyric and formed a lifelong relationship with the theatre. As well as performing with the Lyric, Mr McCready was also at Stranmillis College training to be a teacher. And it was whilst he was at Stranmillis that he met his wife Joan, who he described as “the centre” of his life. After a brief stint as an advertising manager, he quickly realised his passion lay in the world of theatre and education so he left the corporate field and went back to teaching. He inspired the next generation of writers and performers during his time as a teacher at Orangfield Boys High School, before going on to lecture at Bangor University in Wales, where one of his students, Danny Boyle, went on to become a world famous director. An invitation to direct a play brought him to the USA, where he was offered a post as a professor at the University of Maryland. Having retired from full-time teaching in 2001, Mc Cready was by no means ready to rest on his laurels. He and his wife Joan went on to set up Two-for-One Productions, a touring company which specialises in small-scale productions. 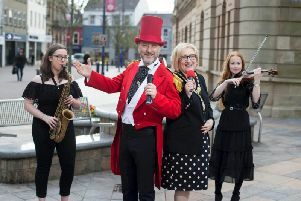 Roisin McDonough, CEO of the Arts Council said Mr McCready’s influence on the shape of professional theatre in Northern Ireland “cannot be overstated”. She added: “The word legend is much overused, but with Sam McCready, the epithet is no exaggeration. Mr McCready’s legacy will “reverberate for years to come”, the Lyric Theatre’s executive producer has said. In a poignant tribute, Jimmy Fay described Mr McCready as a “titan of Ulster theatre”, adding: “His passion for theatre was life affirming and pragmatic. The Lyric will be leading tributes to Mr McCready from the stage tomorrow evening.